A humble ingredient held the key to coaxing ordinary black-and-white photographic chemicals into producing dazzling full-color images. Autochromes, it turns out, are pictures from potatoes. There is a lot to be said for the potato: satisfying, filling, nutritious, historic (think Irish Potato Famine.) The spud even has a secret artistic side: in its lowliest form, pulverized into a powder of starch, it is the key ingredient of the most beautiful color photographs ever made. Called "Autochromes," these potato-powered pictures on glass were the earliest natural-color photographs to achieve success in the marketplace. 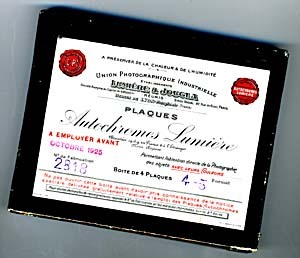 The process for making the plates was patented by the French brothers Louis and Auguste Lumiere of Lyon, just a few short years after their invention of the cinema. Although the French patent for Autochrome plates was issued in 1904, it wasn't until three years later that manufacturing problems were solved and the plates went on sale. All are amazed at the remarkably truthful color rendering; the wonderful luminosity of the shadows, that bug-bear of the photographer in monochrome; the endless range of grays, the richness of the deep colors. In short, soon the world will be color-mad, and Lumiere will be responsible. The inventive Lumieres had found a way to apply a principle of color reproduction first demonstrated in 1861: all of the colors of nature can be captured and reconstructed using three primary colors of light -- red, green, and blue. Most experimenters sought to take three simultaneous pictures of a scene, one through a red filter, one through a blue filter, and the third through a green filter. The three photographs were then combined into one by a projection system or a special viewer. 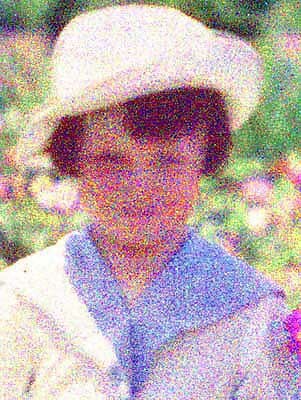 The Autochrome process instead used millions of tiny color filters spread over the surface of a single plate of glass. These microscopic specks were made of potato starch, dyed red-orange, green, and violet-blue. The Lumieres reported they used eight or nine thousand of these filters per square millimeter, which works out to between five and six million per square inch. Those potato starch specks are too small to be seen by the naked eye, but on close inspection a grain pattern is visible on Autochromes. That's because it proved impossible to mix the dyed dots in a perfectly random pattern. The result: tiny clumps of same-color grains that can just barely be discerned. (The background of this text shows the dot pattern from the light-blue sky of an Autochrome. From a distance, it looks like a solid color, but get close enough and you can see the dots.) TV screens and printed color photographs work in much the same way: they're composed of small spots of primary colors that our eyes and brains combine into a full range of color effects. To make an Autochrome plate at their factory, the Lumieres began with a clear sheet of glass, which was coated with a thin, transparent layer of sticky varnish. The microscopic dots of dyed potato starch, blended into a fine grey powder, were then carefully dusted onto the sticky layer. This was precision work for the time, because it was important to have only one layer of dots. Next, the dots were squashed and flattened by running the glass plate through rollers exerting tremendous pressure-- more than five tons per square inch-- without shattering the glass, of course. After that, extremely fine black dust was used to fill up any spaces remaining between the flattened dots. The layer of colored specks was then sealed, and a light-sensitive black-and-white photographic emulsion was added. The plates were packed in light-tight boxes that could only be opened in a darkroom. To understand how Autochrome plates work, it helps if you think of the black-and-white emulsion that's behind each of the color dots. After exposure in the camera and processing, that light-sensitive layer becomes a positive transparency. Every place where light struck the emulsion during exposure becomes a clear spot, and every place where no light came through is opaque black. When making an Autochrome of a red apple, for example, the red light from the exposure passes through the orange-red dots but is stopped by the green dots and the purple-blue dots. So every place there is a red dot the emulsion behind it ends up clear, while it's black behind the green and violet-blue dots. When you hold the finished plate up to a light source, light passes through the clear spots and the red dots in front of them, and you see a patch of red light. But light is blocked by the black emulsion layer behind the green and violet-blue dots. All you see is the red of the apple. Special viewers called "Diascopes" were designed to heighten the experience of viewing these luminous color images. 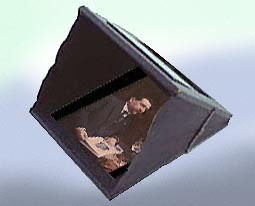 In a Diascope, the Autochrome image is seen reflected in a mirror, with all extraneous light blacked out. The experience of looking at an Autochrome has been likened to seeing a large stained-glass window from a distance; the picture is a glowing mosaic of colored light. Because the color dots are so small and so closely packed, the colors of adjacent dots seem to blend together, just like the pixels on a video screen. Light from neighboring red and green dots combines to produce yellow, and violet-blue and green dots combine to make turquoise. A nearly endless array of colors can be created by this method. To view this exhibition with a broadband connection, please click "First Image" below. To see the images in reduced format and without text, click "Gallery View." Top to bottom: Potato "exaggeration" photographic postcard by Flanders of Hereford, Texas; Autochrome made through a microscope showing Autochrome grain structure (Mark Jacobs Collection); Autochrome plate box, 1925; Diascope view (left) courtesy Mark Jacobs; enlarged detail of an Autochrome by Genthe shown in this exhibition. Copyright ©MMVII The American Photography Museum, Inc. All Rights Reserved. American Museum of Photography and the logo are Service Marks of The American Photography Museum, Inc.